Well-known preacher and literary scholar John Killinger has combined his talents to provide a revolutionary study of the Gospel of Mark. On the basis of textual patterns he discovered in a Gospel long believed to be “naive” and “unstudied,” Killinger reveals evidence that the two calming-of-the-sea stories traditionally regarded as miracles are actually post-resurrection stories. This explanation not only accounts for the absence of such stories at the end of the Gospel, where the other Gospels place them, but suggests that Mark might actually be a Gnostic document, as the Gnostics believed in the resurrection of Jesus but did not emphasize his physical resurrection. A gnostic origin for Mark also explains other long-standing enigmas in Mark, including its high opinion of women (the Gnostics had women priests); the annoying stupidity of the disciples (they had trouble grasping the gnosis); the amazing recognition of Jesus’ real identity by a blind man; and the so-called Messianic Secret (Gnostics wanted to conceal their rites and teachings from outsiders). 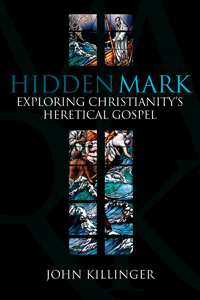 In this groundbreaking interpretation of the Gospel of Mark, Killinger has given us a reason to reassess the meaning and purpose of the Gospel of Mark.